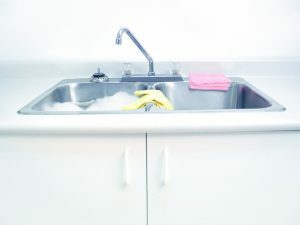 Substances such as fats, oils, and grease might be safe to cook with, or even ingest, however, they can pose a serious threat to your plumbing system. These substances will coat your pipes and create sludge. As these liquids cool, they solidify, and over time, can lead to a completely clogged pipe. Plus, it creates an opportunity for other materials to become caught in the pipe. You would think that an item that has been marketed as ‘flushable’ is safe to flush down your toilet. However, flushable wipes have been known to cause blockages. Wet wipes simply do not break down as easily as toilet paper does. The only things that should ever be flushed down the toilet are toilet paper and waste. Although coffee grounds are tiny and seemingly harmless, they can be a major threat to your plumbing. They have a tendency to stick around in your pipes, leading to clogs. Homeowners often believe that their garbage disposal is meant to break down any food item thrown into it. However, small bits of eggshell can get stuck in the grease already sitting in your pipes, creating a thick substance that can easily cause a blockage. In addition, the membrane layer of the eggshells has the ability to wrap around the shredder ring of the garbage disposal, which can lead to repairs. Dental floss, hair, and other stringy items are not easily flushed down the toilet. In most cases, they end up swirling around until they come into contact with other sticky substances. Plus, these items often swirl into knots and clumps, increasing the likelihood of a clog. Call a plumber! Unless your clog can easily be resolved with a toilet plunger, it is best to leave it in the hands of a trained professional. Your plumbing system is extremely intricate, and clogs can occur in a variety of places. Besides, most of the plumbing tools you can find in your local hardware store are ineffective and can make the problem worse. Be sure to NEVER put chemical drain cleaner down your drain in an attempt to clear a clog. These cleaners contain corrosive chemicals that can eat away at your pipe to cause leaks or even push an existing clog deeper into the plumbing system. To schedule your plumbing services, contact Bayonet Plumbing, Heating, & Air Conditioning today!